For most of our lives, we take our muscles for granted. Pulling, pushing, lifting, squeezing, breathing, balancing… Muscles do it all, and they simply work. At some point, though, we start to notice a difference. Our muscles don’t seem as strong as they used to be, and we have to work harder to maintain their strength, mobility and function. There’s a name for the muscle loss associated with aging: sarcopenia. It’s a common problem, and it starts earlier than you might think: after age 30, we lose up to 5% of our muscle mass per decade, with sedentary types losing the most. The older we get, the faster we lose it – sarcopenia starts accelerating as early as age 65. Experts think that several factors contribute to sarcopenia. Physical inactivity is one of them, but it’s not the whole story, since active people also lose muscle. Other reasons may include age-related hormonal changes that reduce muscle cell growth, reduced nerve activity, inflammation, insufficient protein or calorie consumption, and a decline in our ability to get energy from protein. Researchers are working to better understand sarcopenia. For example, one recent study looked at whether eating more protein can help prevent muscle loss in older adults (conclusion: likely yes, but further research is needed). Another study explored the connection between muscle health and declining nerve activity (conclusion: regular exercise could help grow new nerves and preserve muscle mass and strength). The search for answers continues, but in the meantime, we can slow down muscle loss by living a healthy lifestyle, including regular exercise. 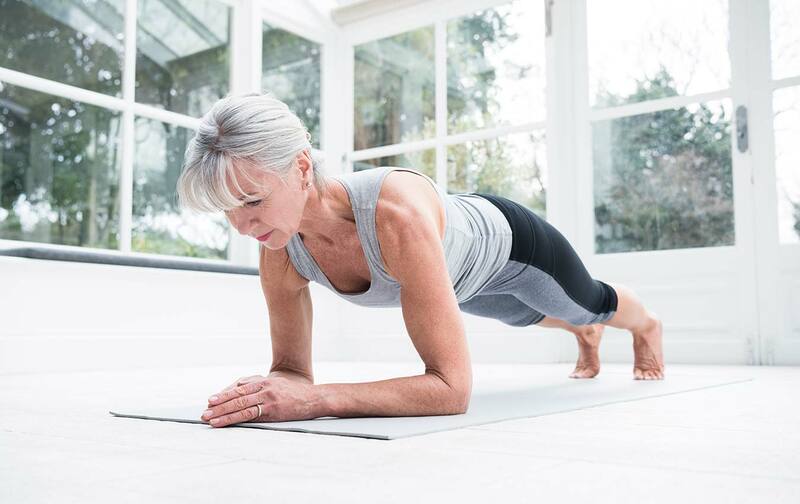 Exercise: One of the biggest contributors to sarcopenia is a sedentary lifestyle, so it makes sense that exercise is the best medicine – particularly strength training and resistance training, such as lifting weights and using resistance bands. Experts recommend doing strengthening exercises two or three times a week. In addition to boosting strength, resistance training can make our growth-promoting hormones more effective (helping muscles grow and heal) and improve our ability to convert protein to energy. It also helps to prevent osteoporosis (the weakening of bones, which increases the risk of fractures). Bonus effect: exercise is a mood enhancer. Walking and aerobic exercise can also help stave off muscle loss. Before you change or start your exercise regimen, be sure to consult your physician. Diet: Many older adults don’t get enough calories or protein in their diets. Experts recommend getting 25 to 30 grams of protein at each meal. Healthy sources of protein include lean meat, fish, eggs, beans, skim milk and Greek yogurt. Talk to a registered dietitian or a physician about ways to get more protein in your diet. Ask if supplements, such as meal replacement drinks or protein powder, are suitable for you. Medical treatments: In some cases, testosterone supplements or growth hormone supplements may help combat muscle loss; talk to your physician. To help yourself keep moving and stay strong, check out your local community centre for seniors’ fitness or aqua fitness classes. If you are just starting out, consider hiring a Bayshore caregiver to accompany you on walks or to help you prepare nutritious meals to ensure you’re getting the calories and protein you need.